Sony has announced plans to let PC owners play PlayStation4 (PS4) games on their home computer. It announced the extension to its PlayStation Now streaming service in a blog but gave no date for when the games would be available. It said it would start small-scale trials with some games over the "next few weeks". Many people already use PlayStation Now to stream older PS3 games to the newer PS4 console and to PCs. Brian Dunn, a spokesman for Sony, said in the blog that a standard subscription for PlayStation Now would include access to the PS4 games. In the UK, a subscription costs £12.99, and in the US $19.99. Mr Dunn did not give any details about which titles would be available first via the streaming service. Currently, 483 older PlayStation games are accessible via the Sony service. 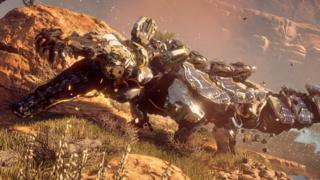 Brendan Caldwell, writing on the Rock, Paper, Shotgun website, said many gamers were keen to try out PlayStation exclusives such as Resogun, Bloodborne, The Order: 1886 and Horizon: Zero Dawn. "However, it's unlikely that all of these are going to be available straight away," he wrote, "but those which were released early in the machine's life will probably appear." Mr Caldwell cautioned gamers to try the service before they took up a subscription, as it requires fast net-connection speeds to work well. Sony recommends a minimum broadband speed of 5Mbps for the service. Mr Dunn said invitations to the tests and trials would be going out to a few active subscribers soon.